1983 was a busy year for Bowie and a very busy one for me so some details are confused. 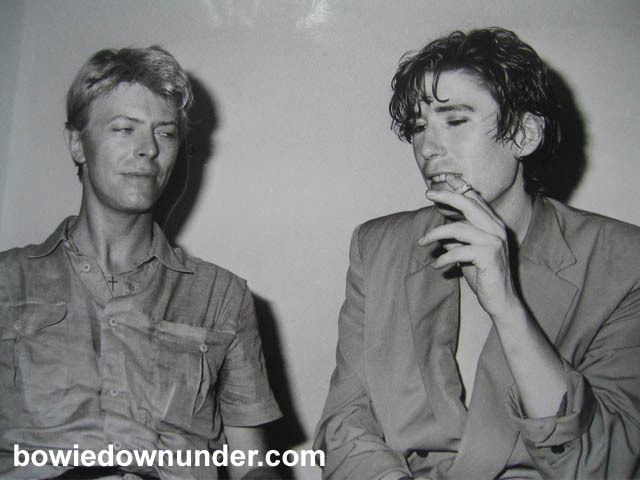 In early '83, David Bowie was in Sydney to film the 'China Girl' and 'Let's Dance' videos. He was staying at the Sebal Townhouse. I was promotions manager for CBS (Sony) Records. 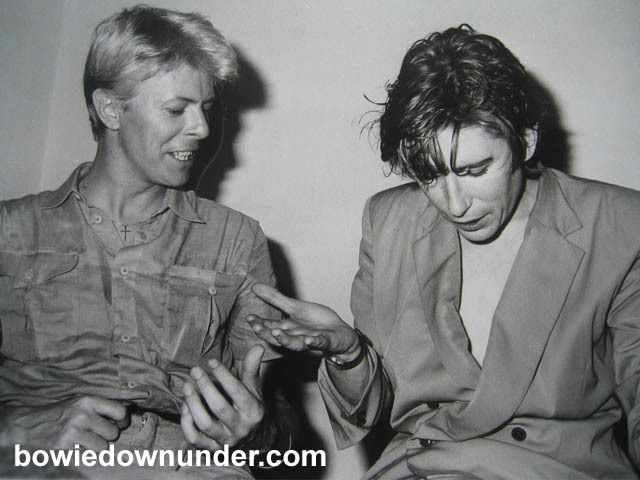 I had Psychedelic Furs on tour at that time so I sent an invitation to Bowie at the hotel asking him to their gig at Selina's Coogie Bay Hotel. To my surprise I got a call from a minder saying Bowie would accept my invitation and what were the security arrangements for his arrival and departure etc. I arranged for Bowie and his minder to meet me in the hotel's drive-in bottle shop. Bowie arrived on time and he, his minder and an Asian girl (much later identified on seeing the 'China Girl' clip as Geeling). I whisked them through an entrance to the residential part of the hotel and into the venue's back-stage area. There was a private balcony above the crowd right in front of the stage. Bowie, Geeling, my girlfriend and I plus the minder sat there through the whole gig. After the set we retired to the band room. 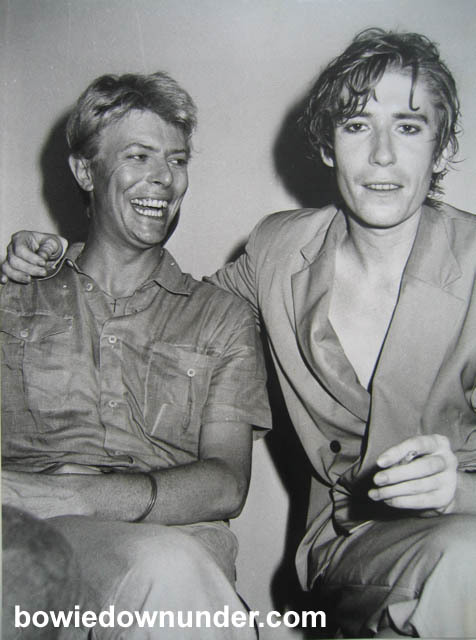 David Bowie and Richard Butler. Photo by Fiona Hamilton. From Bruce Butler's Collection. Soon, the band started to arrive from stage. 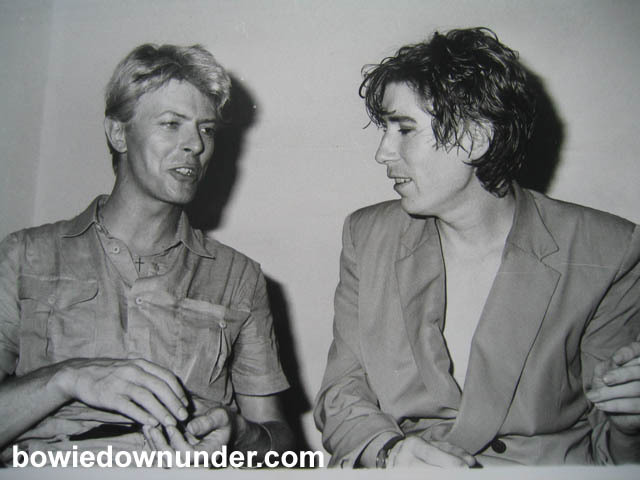 When Richard Butler arrived wearing his big blue suit Bowie said, "Hey! Didn't I wear that on my Diamond Dogs tour? I wondered where it'd gone." Then the cellist arrived and Bowie asked if he could borrow her cello. He then told us he'd just made a film in New York and had learnt to play "the thing". He then proceeded to play some music from The Hunger. My old friend Phil Calvert who was playing drums for The Furs on this tour then sat with us. David showed us a party trick where he balanced on one leg on an empty can of beer then bent over tapping the can on it's sides making it collapse to a pancake. He was in a playful mood. David, Richard and I sat together for ages talking about all sorts of stuff including David telling us of a terrible new disease which had recently claimed the life of Klaus Nomi while he was in America. The disease didn't have a name then but later I came to know it as AIDS. Bowie was very friendly with Geeling and after our long backstage gathering, the two were off to Tamarama Beach for a bit of fun in the surf. I also had a couple of photos and a copy of the Philips David Bowie album with me. When I produced the album Bowie said "Where did you find this antique?" 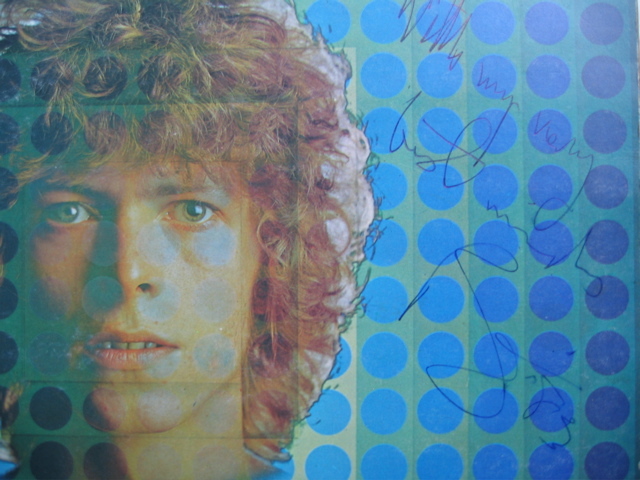 He then signed it "With my very best wishes, Bowie '83". 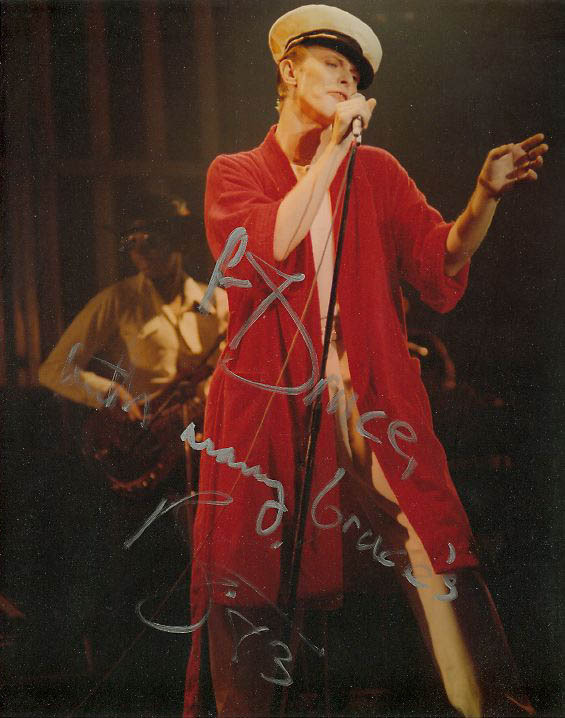 Bowie then signed a 10x8 photo a friend had taken in Sydney '78 "for Bruce, with many Bruce's Bowie '83" and a second photo for my girlfriend "To Zara with best Bruce" but didn't put his name. When she saw it she said it looked like I did it and I had to ask him to put his name to it which he gladly did. Sydney 1978 concert photo. From Bruce Butler's collection. Later in the year Bowie returned for the Serious Moonlight tour. I had left CBS to help set up Virgin Australia and was extremely busy as there was only two of us running the company at that point. When Bowie arrived I had John Foxx (founder and former lead sing with Ultravox) in the country and I was traveling with him. 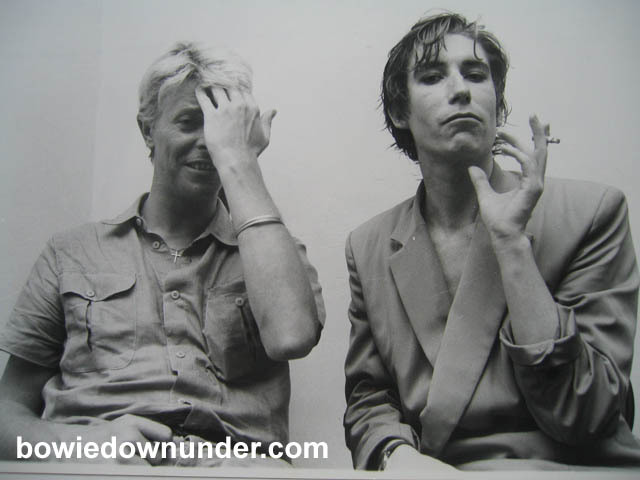 Luckily we were in Melbourne to do Countdown the same time as Bowie was doing his show at Waverley so I arranged passes for us both as John was also a big Bowie fan. Molly Meldrum also invited me to his place for a BBQ he was having for David. John and I attended and as usual it was extremely well (over) catered but unlike usual it was a very small crowd. Even Bowie's band weren't there. I introduced John to David and they had a great rave. The Models, who supported on the tour, were also there and James Freud came up to me and asked for an introduction. I went to introduce him to Bowie but he stopped me and said "No, I mean I want to meet John Foxx. He's my hero! ".